Gary Cooper was one of Hollywood’s most iconic leading men. He starred in classic movies like High Noon (1952), Sergeant York (1941) and For Whom The Bell Tolls (1943) just to name a few. But while Cooper was a conservative Republican, there was a brief moment when the FBI thought he might be a communist. Seriously. Gary Cooper was the “man’s leading man” in classic films, playing sheriffs shooting down gunslingers of the wild west and freedom fighters battling the fascists in Spain. Tony Soprano repeatedly refers to Cooper with admiration in the HBO series The Sopranos, wondering what happened to that old school version of masculinity. Cooper was, in fact, loved by people of many political stripes, especially when he stood up for the “common man” in populist films like 1941's Meet John Doe and 1936's Mr. Deeds Goes to Town. But Cooper was also a controversial figure when he testified as a friendly witness to the House Un-American Activities Committee (HUAC) in October of 1947.
Cooper didn’t exactly “name names” in 1947, but he said that he had turned down roles with scripts that were “tinged with communistic ideas.” The irony, of course, is that by today’s standards many of Cooper’s best films would be considered left of center politically. Maybe even downright socialist if Fox News were to tell it. In Frank Capra’s Meet John Doe, as just one example, Cooper plays an unemployed man in the depths of the Great Depression who accidentally starts a massive political movement built on simply spreading kindness to your neighbor. Sounds pretty commie to me. Shortly before Cooper’s testimony, there was a period of genuine confusion for the FBI when the agency got reports that Cooper was speaking to a large crowd of communists. And it wasn’t just any crowd of communists either. It was a 90,000 strong group in the middle of Philadelphia. As it turned out, the entire thing was a propaganda effort for South American communists who were capitalizing on his role in For Whom The Bell Tolls, a film about an American fighting on the side of the Republicans and the Communists in the Spanish Civil War. Gary Cooper was never a soldier in the Spanish Civil War, fighting against the fascists. But he did play one in the movies. For Whom The Bell Tolls was released in 1943 at the height of World War II. Based on the book by Ernest Hemingway, the film stars Cooper as the Robert Jordan, an American fighting against the fascists in Spain. 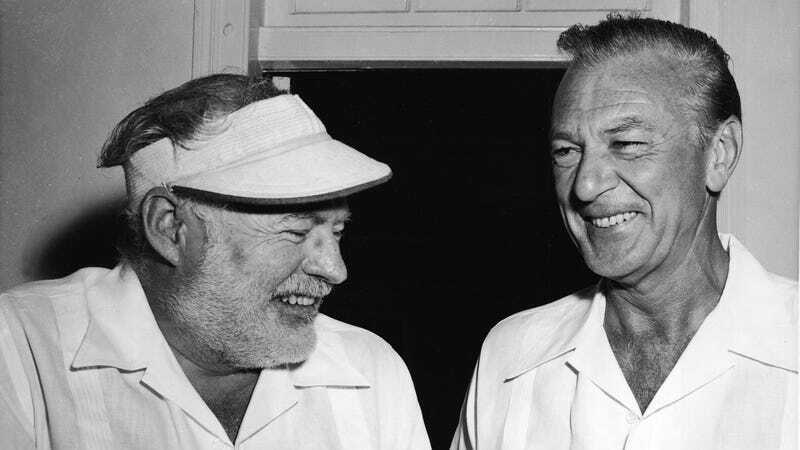 Hemingway was a good friend of Cooper’s, despite their opposing political views, and the writer loved seeing the actor in his movies. But according to Cooper’s FBI file, which I obtained through a Freedom of Information Act (FOIA) request, a communist newspaper in Rio de Janeiro took the idea of Cooper as the ultimate anti-fascist and ran with it. Cooper, according to the newspaper, had given a rousing speech about his admiration for communism. And rather than simply dismiss the idea, the FBI actually went to the trouble of contacting their people in Philadelphia to make sure that there wasn’t a communist rally there where Gary Cooper had given a speech. It all seems so silly now, but Cooper was even asked about it when he testified in front of the HUAC. The rest of Cooper’s 27 page file, which I’ve uploaded in its entirety to Archive.org, includes things like the English translation for the speech that Cooper was alleged to have given. And if you knew anything about Cooper’s politics, you knew that he wouldn’t have said anything like what’s presented. But that’s the power of the movies. Cooper became such a symbol of the average American on the screen that he was the natural choice for communists in South America to embody their message. It didn’t hurt that he was often depicted as the one willing to take up arms to defend freedom in other countries, most notably in movies like For Whom The Bell Tolls. An article of unknown origin in the FBI file even made the explicit leap to Cooper’s portrayal in For Whom The Bell Tolls. The previous page in the file is heavily redacted, so it’s not clear where this article appeared, but it begins by stating as fact that the real life Gary Cooper had gone to Spain to fight in the Spanish Civil War. While some famous people outside of Spain did go fight in the Spanish Civil War, such as George Orwell, Cooper simply made movies about it. Cooper died in 1961 at the age of 60, and despite the fact that he never named names he was still never fully forgiven by many in Hollywood for testifying as a friendly witness to Joseph McCarthy’s witch hunt. But the fictional Tony Soprano and plenty of other very real people still love Gary Cooper’s films. In fact, his 1952 western High Noon is the most popular movie in the White House. It was screened by presidents Eisenhower, Carter, Clinton, and George W. Bush. There’s no word if President Trump has watched High Noon yet. But perhaps he’s busy watching the TV channel that tells him just how heroic and handsome he is every day. Just like Gary Cooper in High Noon, no doubt.